Metroplex Westgate builds on the achievements of the ground-breaking Metroplex Gateway development by offering a location so accessible, so connected, so well facilitated and resourced that its benefits will challenge those offered by Brisbane’s high profile, commercial centres within its CBD, the Airport Precinct and Port of Brisbane. Metroplex Westgate - Brisbane’s Western Business District. Upon completion Metroplex Westgate will encompass some 90 Hectares. Below is illustrative of this vision. Located in Wacol on the doorstep of Brisbane’s western growth corridor, and covering some 90 hectares, Metroplex Westgate sits at the nexus of not one, but three motorway systems. Travelling north, south or west will see you on a motorway heading for your destination within minutes. Commuters too will find travelling to and from Metroplex Westgate a breeze with the choice of both rail and bus transport options. Consisting of four distinct precincts; Metroplex Westgate East, West, South and The Etro – Metroplex Westgate offers a diverse array of precinct profiles to cater for the individual needs of the diverse businesses that will be attracted by the Metroplex Westgate ideal. Whether they be logistics, manufacturing, service or technology. Whilst each precinct offers operational specific allotment footprints, each precinct is interconnected by some 17 hectares of parklands and green belts to the service centre and heart of Metroplex Westgate, The Etro. The Etro precinct will have a lifestyle focus offering the greater Metroplex Westgate community facilities such as child care, cafés and eateries, convenience shopping, a medical centre and pharmacy. A large allocation of public open space and recreational parkland will provide a picturesque release from the work day within the Etro, ensuring staff have an enjoyable environment to breakout to. For businesses looking to realise the Etro opportunity, it is interesting to note that currently there are limited facilities within the adjacent areas outside of Metroplex Westgate. A region home to some 900,000 Queenslanders. 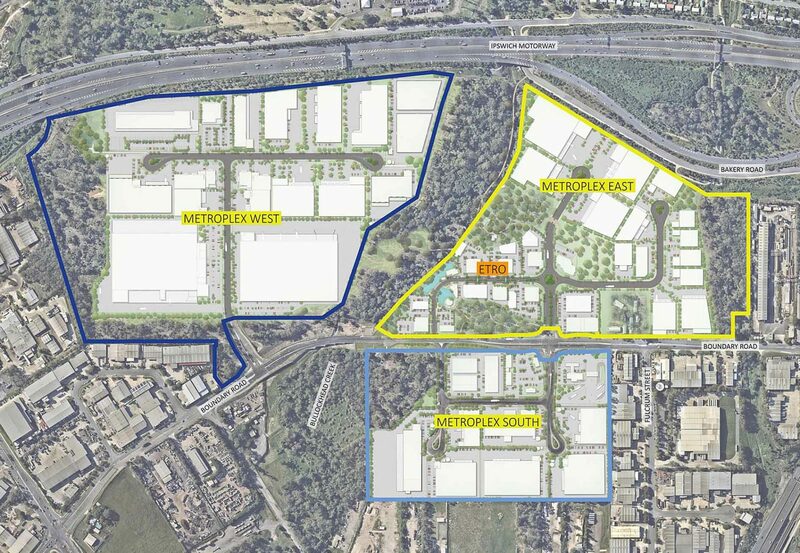 Once again Metroplex have raised the bar in the development and management of industrial business estates in Australia. Together with their partners the GPT Group, Metroplex has purpose designed the master plan of Metroplex Westgate to deliver a true alternative location, rather than ‘a second’ choice for businesses operating in South East Queensland. Copyright GPT Metroplex Pty Ltd © 2019 All Rights Reserved.